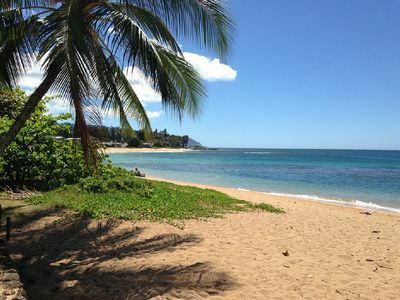 Aloha and welcome to Haleiwa and the North Shore of Oahu! 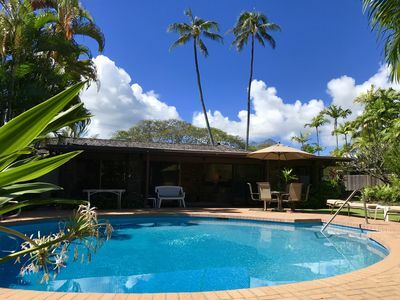 We know that traveling (with or without keiki (children)) can sometimes be stressful so we want to help make your vacation in paradise filled with great memories. 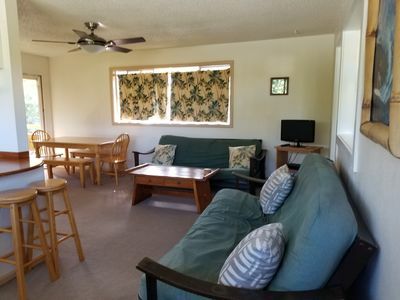 Our newly and completely renovated (June 2014) Hawaiian Style condo is located just past Haleiwa Ali'i Beach Park on a peaceful, pristine, and uncrowded strand of beach with views of Puaena Point and Kaena Point. 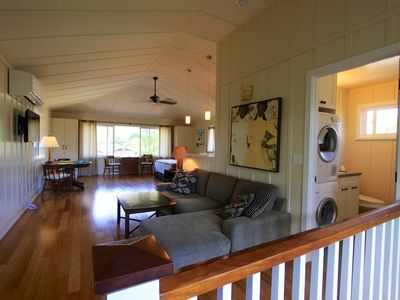 Haleiwa Surf is the only beachfront condominium property in Haleiwa. There are two buildings on the property. 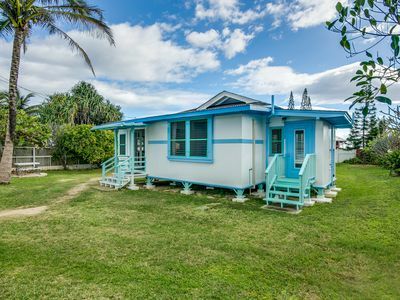 One is closer to the beachfront than the other (ours is the one in the back), but still has a beautiful ocean view. 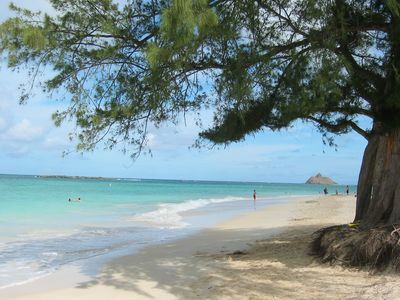 The North Shore of Oahu is known for its legendary winter surf and professional surf competitions. 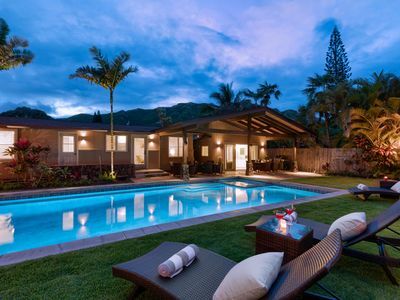 Home to world famous Haleiwa Beach, Sunset Beach, Waimea Bay and the infamous Pipeline. You can walk to Ali’i Beach, where Bay Watch Hawaii was filmed and where the first jewel of the Triple Crown of Surfing Contest is held. While the North Shore is known for its monster winter surf, the beach fronting the condo is protected by a reef. A perfect beach for families. 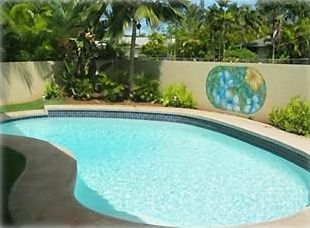 Great for snorkeling, swimming and surfing. 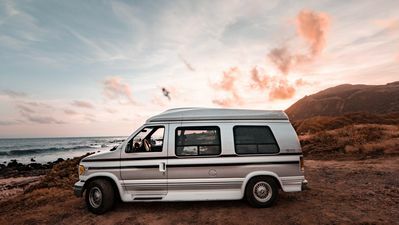 There are several surf breaks within walking distance and other spots within a 15-20 minute drive. 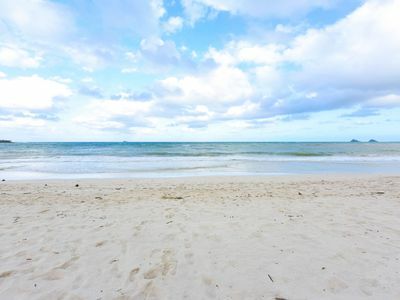 Enjoy running or romantic walks on the isolated sandy beach. Shade trees offer respite and an outside shower is conveniently located on the front lawn. There is a large lawn area for lounging and playing. BBQ and picnic tables are located on the ocean side. Perfect for happy hour and sunsets! 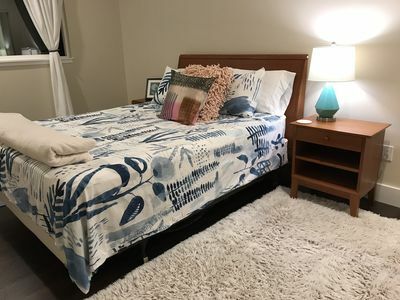 Our 1 bedroom/2 bathroom condo (comfortably sleeps 2 to 5 people, but we can bring an additional futon for the floor if there is another person-please inquire). 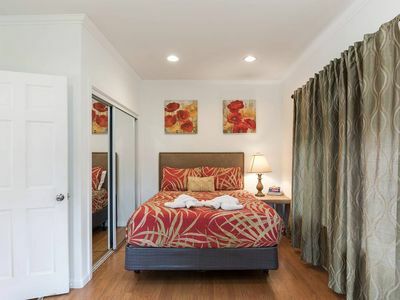 The Master bedroom has a queen bed and an attached full bathroom. 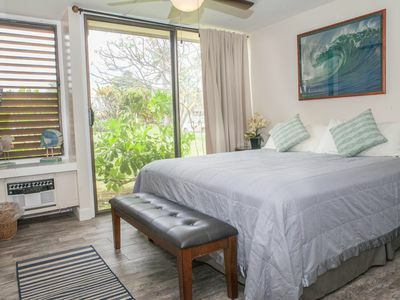 The great room (located ocean side) has a queen size futon, which folds out into a bed. There is also a pune'e (day bed same size as a twin bed) that can be used to sleep on. 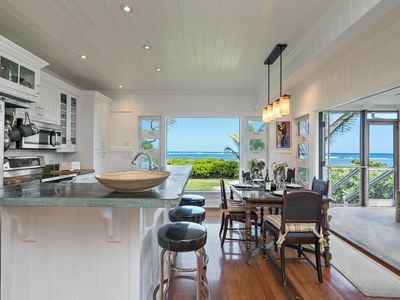 The ocean can be seen from the great room. Both bathrooms have shower stalls tiled with natural stone (so not slippery) with a 12” curb so works well for bathing the kids! We also provide a baby tub, Pack and Play, car seat, and/or collapsible wagon for families visiting with infants/toddlers at no additional charge. 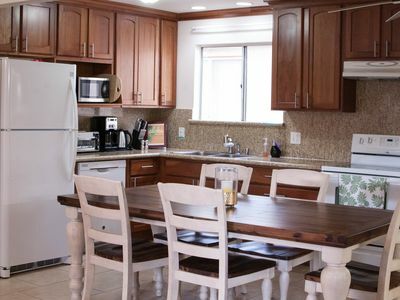 The kitchen is fully equipped... everything you need for preparation, serving, and storage. WiFi and basic cable are included as well as an iHome docking station (in bedrooom), speaker/docking station ( in great room), a 39” flat screen TV and DVD player. A binder with local restaurant menus, local guide books and recommended must-see/must-do are provided. 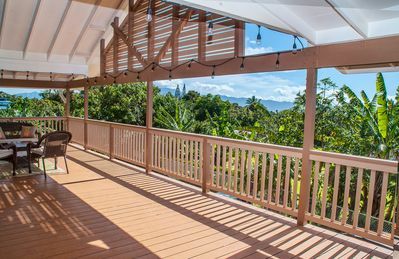 You can enjoy pupus (appetizers), drinks, and the sunset from the lanai (balcony) overlooking the ocean. 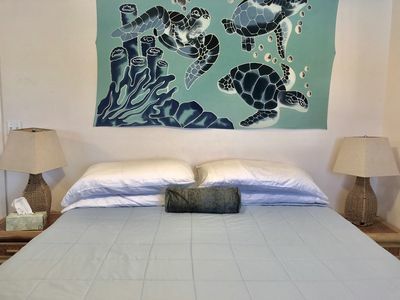 We supply linens, pillows, bath and beach towels, beach chairs, beach umbrella, beach toys, cooler, collapsible cooler bag, body boards, and snorkeling equipment. There are 4 coin operated washer and dryers located on the premises. Bikes (beach cruisers), surf boards, SUP’s, single or double kayak , and mopeds are available for rent. Our daughters, Keola and twins, Nohea and Kahea are available for surf/SUP lessons and even babysitting-please check out: www.alohasurfingohana.com for prices. We also try to leave basic food items from the previous guest such as coffee & filters, sugar, tea, ketchup, jellies, condiments, bottled water, etc... If it is good we'll leave it for you so that you won’t have to start completely from scratch. 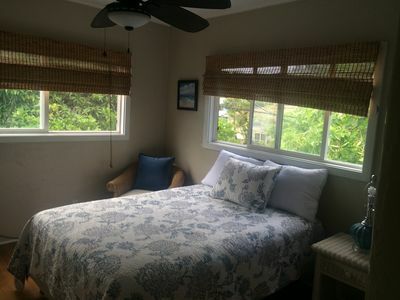 We are within a 1 mile distance to Historic Haleiwa town. Convenient for grocery shopping, restaurants, and souvenirs. Great hiking trails are also a short drive. Our daughters are members of a hula halau (school) and are available for shows/lessons (donation). Their kumu hula (hula teacher) lives on a Lo’i Kalo (Taro farm). 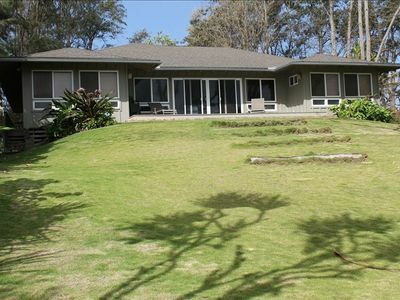 It is nearby and available for field trips (donation to hula halau). The airport is approximately 40 to 45 minutes away. Honolulu/Waikiki is at least an hour drive. If your stay involves travel by bus, the bus stops are within a few minutes walking. If you do not plan on renting a car, pick up/drop off to and from airport can be arranged-please inquire. Golfing, skydiving, fishing tours, surf and SUP lessons/rentals are all available close-by! North Shore Wellness practitioners (yoga, massage, acupuncture, etc) also have ample services available in the North Shore area. Our family took great pride in renovating our unit ourselves so we kindly ask that you take care of everything as if it were your own. 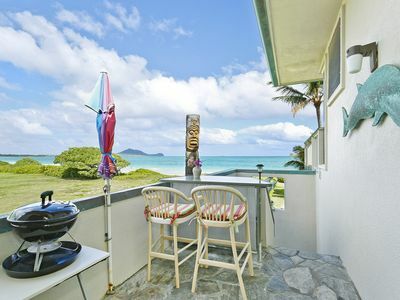 This is a NON-SMOKING unit (even on lanai). There is a designated smoking area in front of the parking lot with a picnic table and on the beach. Pets are not allowed in unit or on the property. We live right down the road so if there is anything you need, please don’t hesitate to contact us. 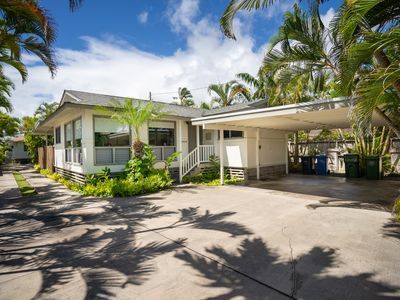 Beach Bungalow in Laie with AC!